One of the best weeks of the year, we have the Thought Bubble comic convention and Batman Judge Dredd Collection is hitting the shelves too and I don’t know which I’m looking forward to the most. The Batman Judge Dredd collection contains three hard to find cross over books which are a good introduction to Dredd if you haven’t read any 2000AD comics before. 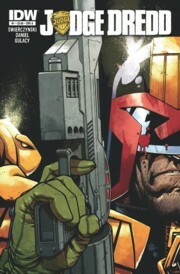 Another Judge Dredd premier this week is Judge Dredd #1 which will be published by IDW. I’m not sure why IDW are printing Judge Dredd comics but I have a feeling it may be to reach out to more people as 2000AD are huge in England but haven’t got the impact some of the bigger publishers have around the world. Either way it will be interesting to see what they do with it.